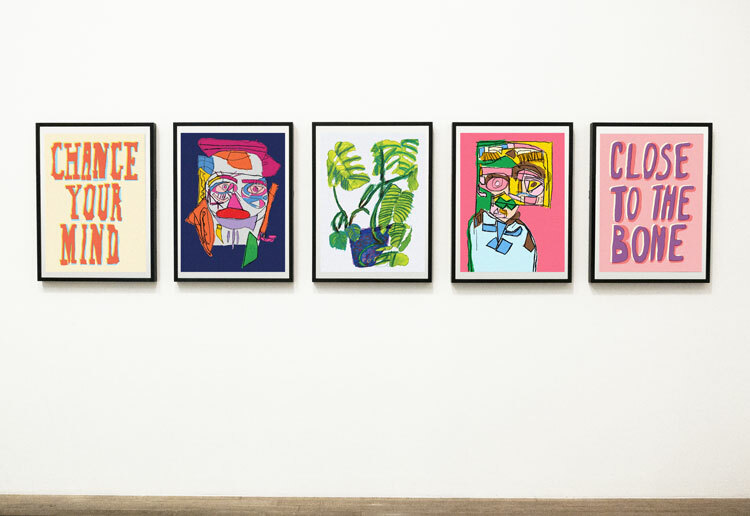 The show at the William Morris Gallery features posters, matchboxes and papercuts displaying slogans inspired by communist leader Chairman Mao. During the rule of communist revolutionary leader Chairman Mao Zedong in mid-20th century China, hordes of traditional works of art and design were destroyed and a new style of heavily-censored, creative work was introduced at the demands of the Government. Born into a peasant family in 1893, Mao was the leader of the Chinese Communist Party (CCP) from 1935 until his death in 1976 and is credited with founding the People’s Republic of China in 1949. The CCP, which Mao co-founded in 1921, came into power following the Chinese Civil War, which saw the previous ruling party, the Kuomintang, otherwise known as the Nationalist Party of China, driven out of the country. The CCP brought a communist ideology to the country, with Mao at its helm, who was inspired by Marxist literature and who favoured the lower social classes, which at the time were mostly comprised of peasants, workers and soldiers. Mao’s rule involved land reforms, which led to many landlords being killed, in order to redistribute land to peasants. He was also responsible for the Great Leap Forward, a campaign that aimed to improve industry and agriculture but resulted in a decline in food and a consequential mass famine, with millions dying as a result. 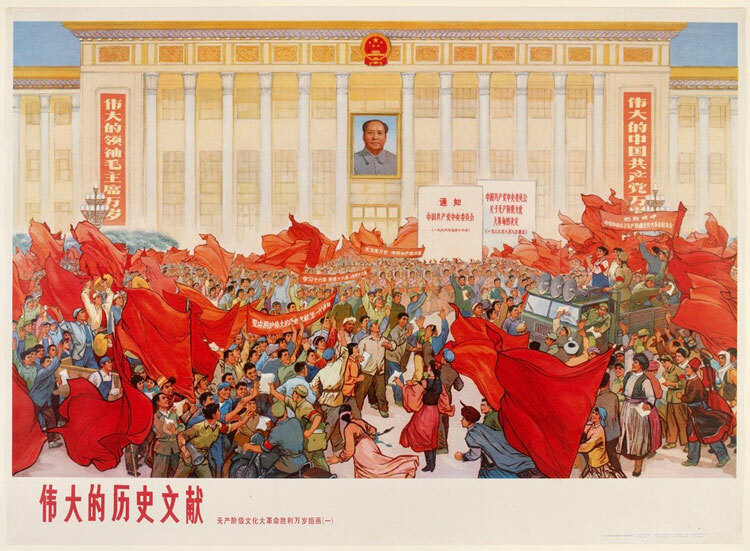 The Great Proletarian Cultural Revolution was another initiative launched by Mao, which looked to purge the country of capitalist culture and ideology. 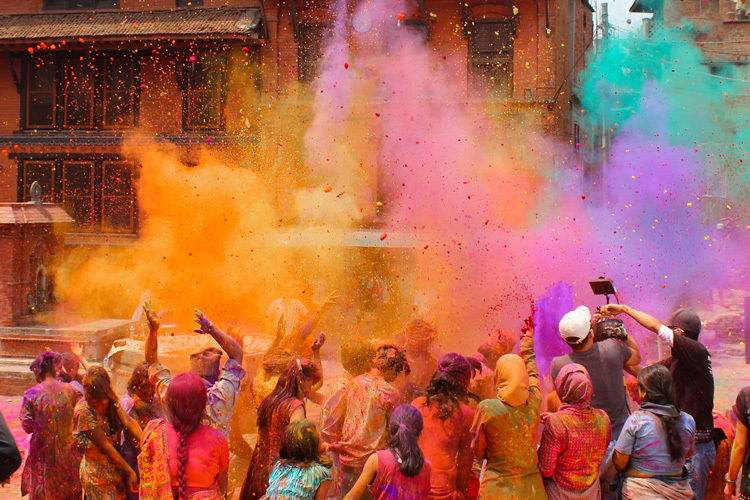 It lasted between 1966 and 1976, and saw a mass destruction of traditional art and culture across the land. 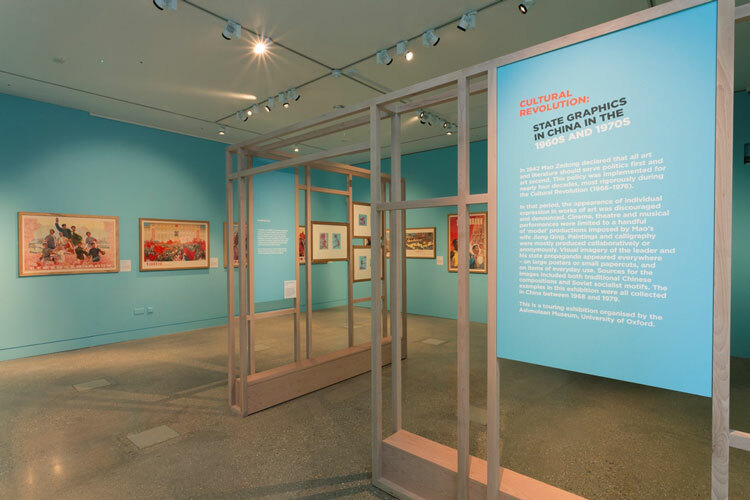 He ordered for all art and design to serve the state and imbue communist principles, catering for the “worker, peasant and soldier”, according to the William Morris Gallery, where an exhibition has opened showcasing propaganda art from the cultural revolution. The show includes 16 propaganda posters, 24 matchboxes showing revolutionary messages and six papercuts — artworks made by cutting out intricate designs from paper. 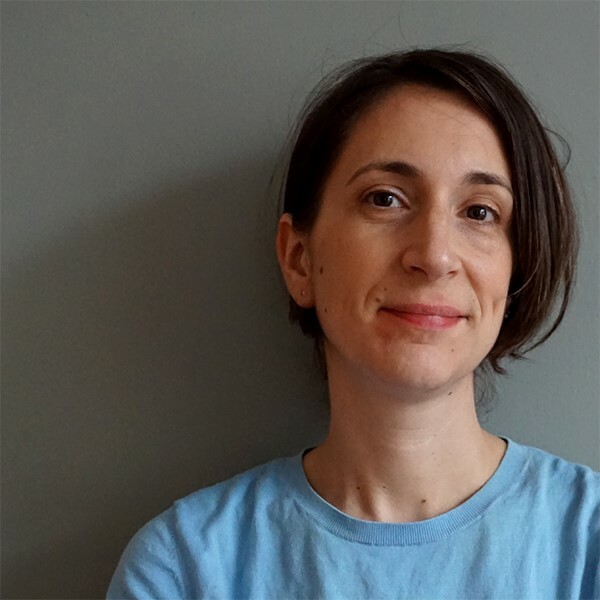 The works date back to a “traumatic and violent” period in Chinese history during the 1960s and 1970s when “huge changes in politics and economics” took place, says Roisin Inglesby, curator at the gallery. An older generation of Chinese artists who created traditional artwork such as ink paintings, were condemned as “counter-revolutionaries” by the Red Guard, a radical social movement led by students in support of Mao. This meant artists risked persecution and imprisonment if they continued creating it. The new art that took its place focused on promoting industrial progress, self-improvement and public health, according to the gallery, often featuring slogans from Mao’s Little Red Book, which is filled with quotations from the communist leader. 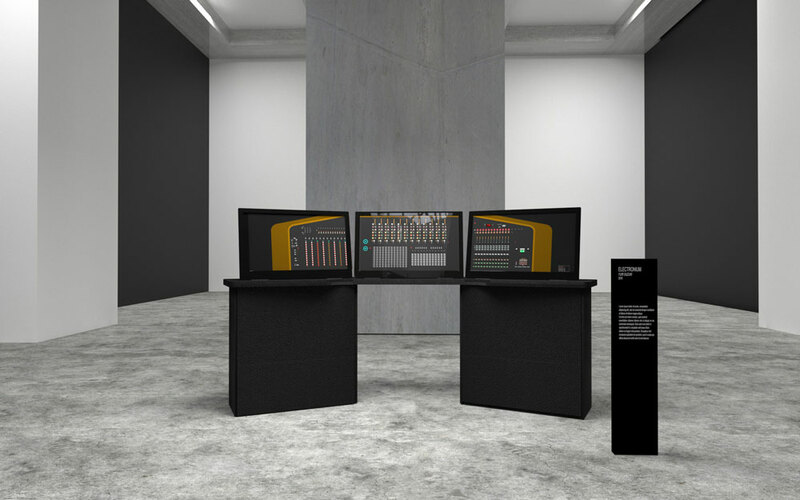 The aim of this exhibition is to “make people think about the relationship between design and politics,” Inglesby says. Many posters which appear in the exhibition, dating back to the 1960s and 1970s, depict Mao in a “favourable” light, she says. 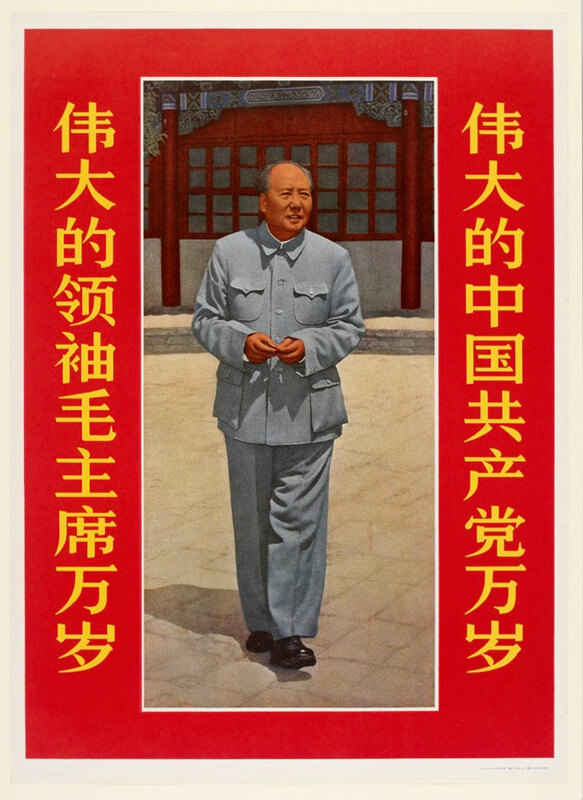 Mao is always “identifiable” in posters, she adds, but other people are generally drawn as “generic types”, such as “the peasant”, “the soldier” and “the worker type”. People in the posters are “idealised”, and usually appear to be “smiling and happy”. 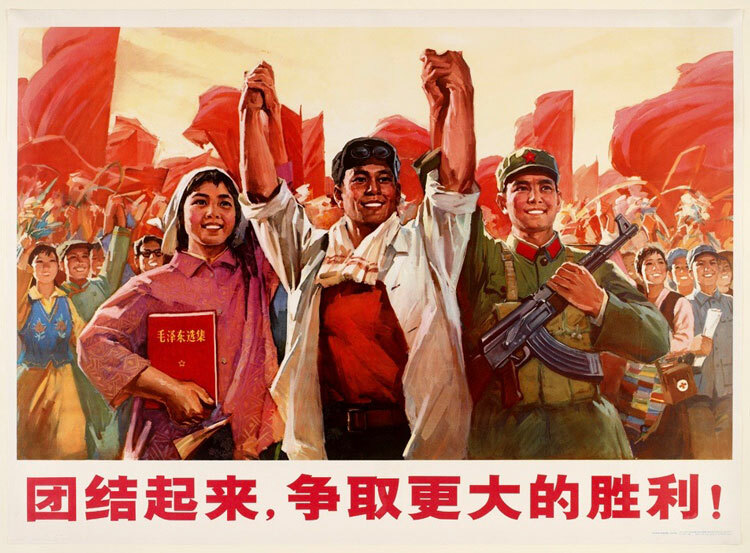 Slogans are often used alongside imagery in posters, usually written in bold, Chinese script. They include pro-revolution messages about “working hard”, “uniting for victory” and “working towards the general communist goal”, Inglesby says. “Bright” colours are used in many of the posters and red appears a lot as “it is the colour of communism and revolution,” she adds. Much of the work that came out of the Cultural Revolution is attributed to committees or groups, rather than individuals. The state-run New China News Agency commissioned some of the works, Inglesby says, which were then published through organisations including the Shanghai People’s Fine Arts Publishing House and Xinjiang Art Publishing House, among others. Thousands of copies of the posters were printed and sold cheaply, she adds, as the establishment at the time wanted the posters to be something “that everyone should have on their walls at home”. Many of the posters were painted by hand and then printed as lithographs, a process involving using stone, oil and chemicals to create prints. The process is based on the fact that oil and water do not mix. It works by using a flat stone, such as limestone, or metal plate to print images on using a greasy substance, such as crayon, which will allow ink to stick to these areas. An acid solution is applied to the stone, then an ink-dripped roller is spread over the surface, with the ink only sticking to grease-receptive areas. Paper is placed over the stone and pressed, producing a print. 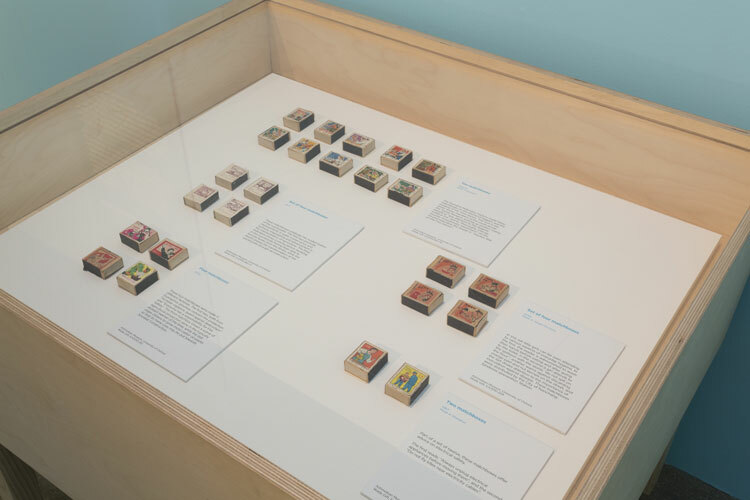 Matchboxes featuring revolutionary slogans are also on display in the show. Some feature public safety announcements about using electricity and keeping up good hygiene standards, among other issues. 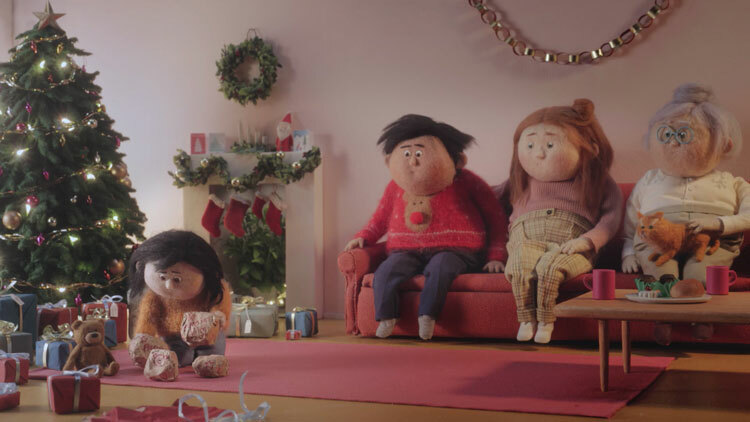 The messages are often accompanied by illustrations, such as a girl washing her hands or a woman unplugging an electrical device. 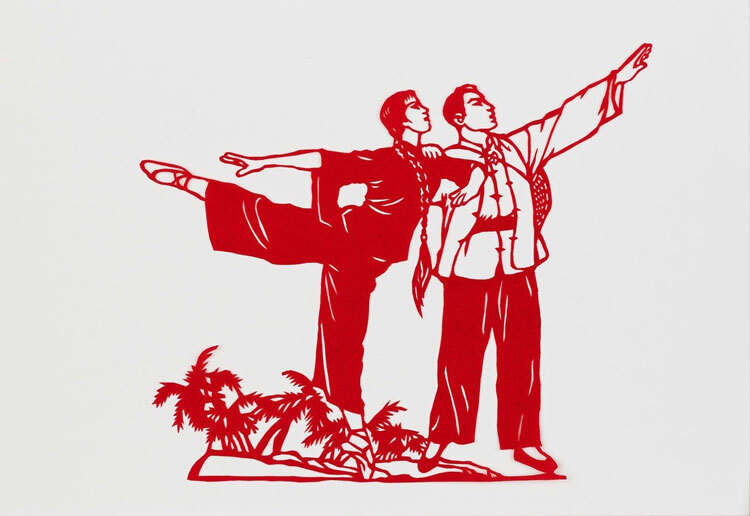 Papercuts, which are a traditional Chinese art form were also used to promote communist ideals. 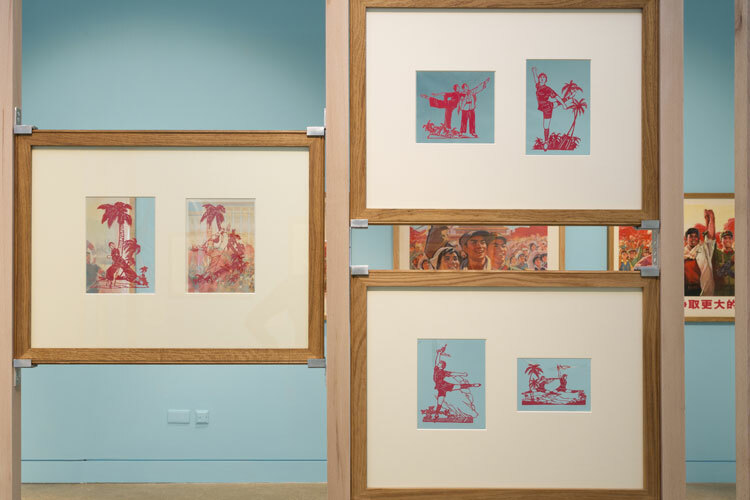 One example of an intricate, red papercut in the exhibition shows a scene from The Red Detachment of Women, a ballet which was created around the time of the Cultural Revolution. 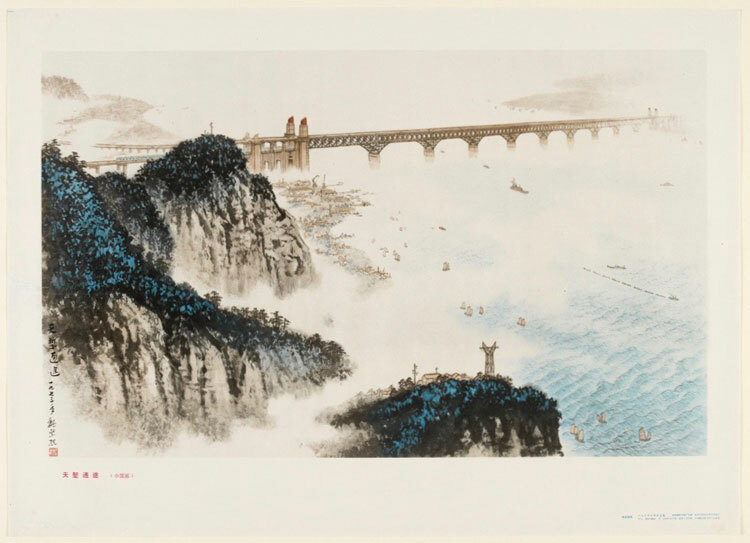 Some posters in the exhibition use a more traditional style of Chinese brush and ink painting depicting landscapes or nature, but they too feature revolutionary elements such as industrial buildings or men in military uniforms. 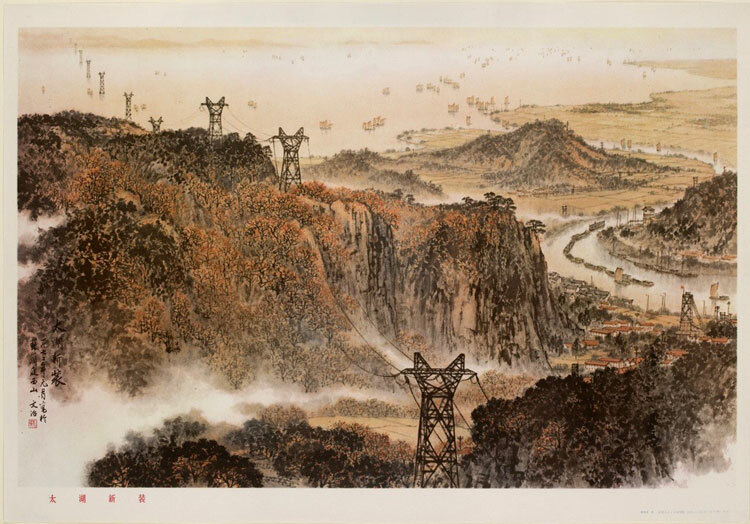 One example of this style is a lithographic poster called New Aspects of Lake Tai, by artist Song Wenzhi, which shows rolling hills and a river with pylons along the landscape. The exhibition, which is in one room, is laid out in three themed sections. 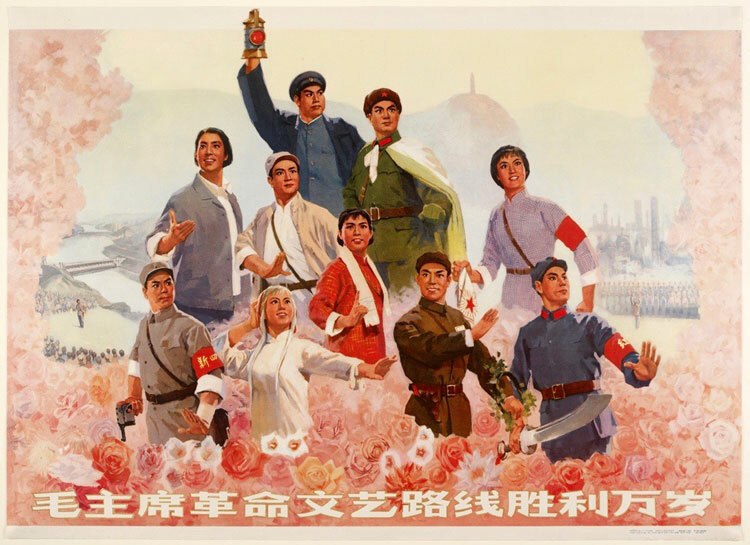 The first is centred around Mao, with posters showing him in a positive light; the second section focuses on political messages, such as a poster called Unite For Victory showing three people smiling and holding hands; and the third section shows images resembling a more traditional style of Chinese art with a revolutionary twist. The matchboxes appear in a glass display cabinet, while the papercuts are presented between two sheets of glass in a freestanding, vertical structure in the centre of the room. The glass display containing these papercuts is surrounded by a wooden frame which mimics Chinese bamboo, Inglesby says. 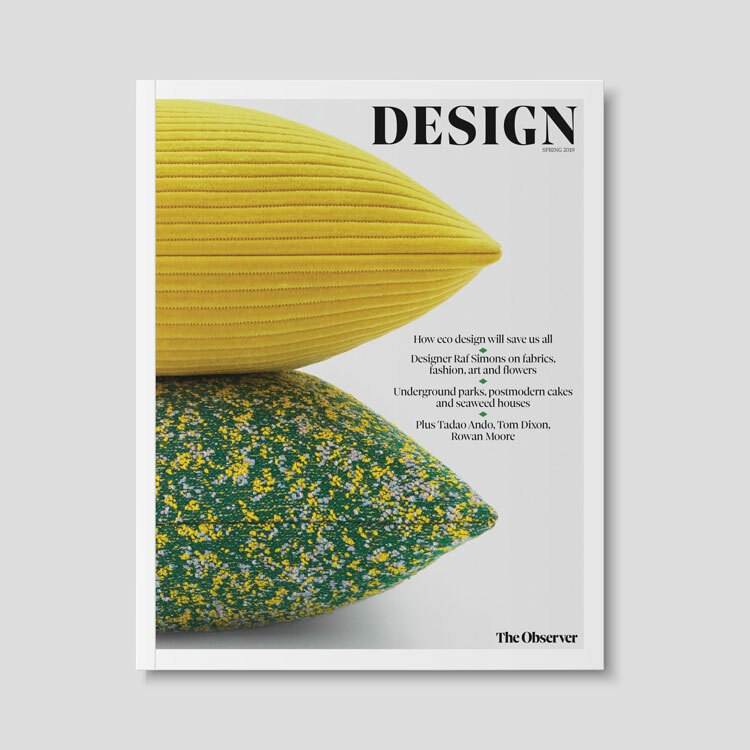 The exhibition space, which has been designed by East London-based studio, The Design Kollectiv, has been given bright blue walls which aim to resemble a “blue sky” and create a “sunny and warm atmosphere”, while highlighting the predominantly red posters, Ingsleby says. 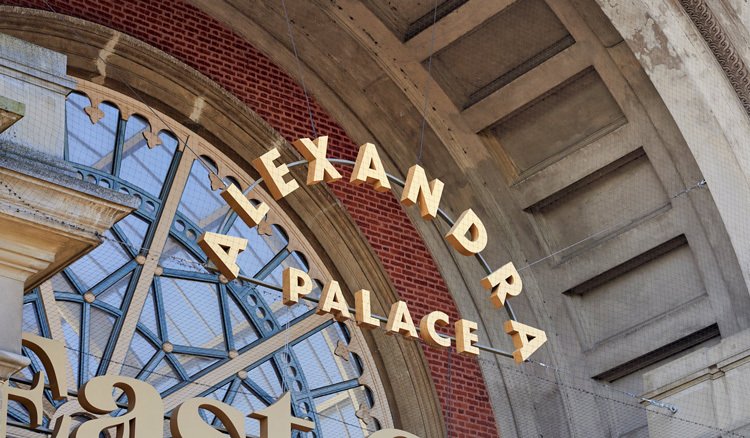 The studio has also created “brightly-coloured” fabric banners for the exhibition which hang in the gallery’s café, featuring slogans in Mandarin on one side and in English on the other. Curators from the Ashmolean Museum in Oxford, where the collection in the exhibition was previously exhibited in 2011, worked closely with the William Morris Gallery on the current show. The collection was originally donated to the Ashmolean by several collectors from China. “Some of the works on display have drawing pin holes in the corners or have been cut roughly so you can see they had a life before they reached the gallery,” Inglesby says. The heritage of the Cultural Revolution for contemporary Chinese artists is a complicated one, she says, with many still “grappling with its legacy, and the place of historical culture within Chinese art”. The CCP, now led by Xi Jinping, is still the governing party in China today. 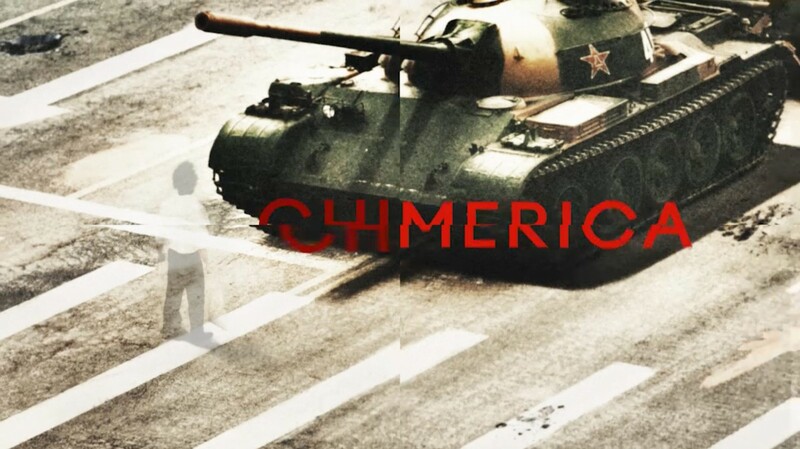 While the Cultural Revolution may be over, censorship is still an issue in China today, with bans on certain content on the internet and social media, along with some cultural material such as films, which are blocked by Government. For example, social media platform Facebook has been blocked in the country since 2009, while cartoon character Winnie the Pooh was banned after being compared on social media to the country’s leader. The exhibition at the William Morris Gallery offers a glimpse into the early days of censorship in China through the art and design that came out of the Cultural Revolution. Cultural Revolution runs until 27 May 2019 at the William Morris Gallery, Lloyd Park, Forest Road, London E17 4PP. Entry is free. Images of artworks: © Ashmolean Museum, University of Oxford. Exhibition installation images: courtesy of the William Morris Gallery.